Brussels, Capital of Europe, the role of the City of Brussels in the European Community was represented by the arms of Brussels in the center of the European flag, with the iris and the twelve flags of the European member countries, in the two great borders of the carpet, all linked by a golden chain. But as 1992 was also the year of the 500th anniversary of the discovery of America, this commemoration was symbolized by a huge mariner’s compass set in the center of the carpet. In 1992, there was a radical change of direction. 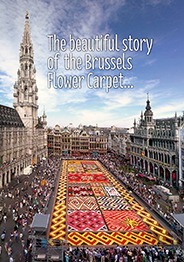 The organizers chose as their theme for the eighth floral carpet “Brussels, Capital of Europe” to reaffirm the commitment of the City to the construction of Europe. Furthermore, as 1992 was also the year of the 500th anniversary of the discovery of America by Christopher Colombus, this commemoration was symbolized by a huge mariner’s compass set in the center of the carpet. The role of the City of Brussels in the European Community was represented by the arms of Brussels in the center of the European flag, with the iris and the twelve flags of the European member countries, in the two great borders of the carpet, all linked by a golden chain. For the first time, light blue was the predominating color in a carpet, which already contained 9 colors, and subterfuge was needed – white flowers had to be sprayed blue. There was another novelty that year: several stalls were located outside the Town Hall, where horticulturalists gave advice and explanations to plant-lovers. “.